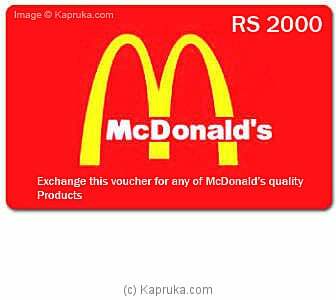 With over 7 outlets in Sri Lanka McDonalds gift vouchers are a popular choice at Kapruka for home delivery. Outlet locations include Dehiwala - Mount Lavinia / Kolpity / Race Course Promenade Cinnamon Gardens / Welisara / Kotahena / Rajagiriya and Nugegoda. Burger King Gift Voucher - R..
Dominos Gift Voucher- Rs 250..
Rs 1,000 NOLIMIT Gift Vouche..
Rs. 4,000 Arpico Gift Vouche..